An imaginary world of magic, mystical creatures, and the overarching desire to find one’s self are a few of the traits we all recognize from fairytales. Natalie Frank, a New York-based artist, has taken the works of the Brothers Grimm and transformed them into a collection of feminist pieces that connect the magical world with everyday life. While admiring the pieces, many find that the stories they escaped to as a kid are actually mirroring the world they live in. See more from this series. Through her natural talent and background education from Yale and The Slade, Natalie interpreted thirty-six different tales through what she calls a “Feminist lens”. She has taken back women’s ownership of the tales since they were originally told orally and collected throughout the centuries by women until the Brothers Grimm gathered and altered them for various reasons. The alterations have been taken even further through Disney where one of the greatest desires of a majority of the female characters is to find true love. Natalie chose to interpret the Grimm versions while adding her own touch and says that the women in the Grimm stories vary from Disney because these women are more complex. They are not always “meek and prim” and Natalie had no interest in traditional gender roles in her drawings. For example, the evil stepsisters in Cinderella did not merely bully Cinderella and loathe in the fact that they could not fit into the slipper. Instead, they went as far as self-amputation to hopefully get what they desired. The stories are shown through bright colors and images that are catching to the eye and the imagination. Natalie owes the pursuit of following her dream career as an artist to many people she has met along her journey. Many of them fostered independence, which is an important trait for every woman. She began drawing when she was twelve years old and took life drawing classes with her mother in an artist named Ellen Soderquist’s garage. Feminism is an overall concept weaved throughout her show. Her independence and female role models have no doubt had a hand in her feminist passion. She defines feminism as “equal rights and opportunity for men and women…basic human rights”. 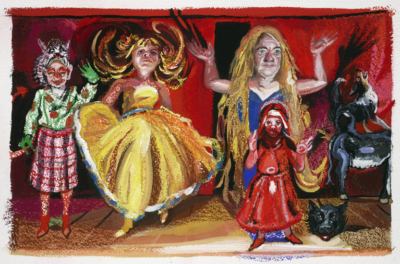 Natalie’s Brothers Grimm show began at The Drawing Center in New York where it was curated by Claire Gilman. It then traveled to the Blanton Museum of Art in Austin where it was curated by Veronica Roberts. Now it can be seen at the University of Kentucky Art Museum in Lexington where it is organized by Stuart Horodner. Each drawing can be taken home in a book available at the show that includes essays by Linda Nochlin, Claire Gilman, and Julie Taymore. Natalie hopes that when people view her works, they see that narratives and our stories reflect a great deal about our humanity. Blair Johnson is an honors student at the University of Kentucky with a major in journalism and a double minor in psychology and gender and women’s studies. She has written for the Kentucky Kernel and USA Today College. Blair was a spring intern at the Lexington Art League and now serves as the Director of Communication for the University of Kentucky Student Government Association. She is also the Director of Academics for her sorority, Alpha Phi, and a member of the University of Kentucky Feminist Alliance. Blair plans to attend law school after her undergraduate career where she will continue to advocate for women’s rights.